The special day has arrived: Your wedding. Along with the intense planning of guest lists, dresses, and cakes, you have to find the perfect location. South Dakota’s idyllic rolling hills and charming countryside make it a dream destination for a celebration. Here are the 10 best wedding locations in the state. Located in South Dakota’s scenic Black Hills, Black Hills Receptions is the big name around town for elegant weddings, either big or small! For over 25 years, this reception hall has made couples dreams come true and helped create thousands of perfect weddings. Available services include wedding coordination services, rentals (tables, chairs, tents for outdoor weddings, etc. ), and decorating. Available facilities include Swan Point on 10,000 acres of scenic Forest Service land with space for up to 300 guests, the Grand Gazebo surrounded by garden and courtyard, Cinderella Gazebo, Fairy Garden, Reception Tent, and Courtyard. This idyllic farm on the outskirts of Sioux Falls is guaranteed to make the big day a memorable one for both the couple and the guests! The location includes seating for up to 300 guests in an elegant dining room on site, free wood table and chair rental, all-season space with heating and air conditioning, bathrooms, accent furniture and decorations, kitchen for caterers, a choice of several ceremony areas (patio, main lawn, pond, or inside), staffed bar, grand staircase and beautiful balcony for pictures, shuttle service for some local hotels, and much more. The full-day wedding location service lasts from 8 a.m. until 12 a.m., so the party can go all night long! Blue Haven Barn and Gardens will make your dream wedding a reality! Situated right along the calming Redwater River in St. Onge, Besler’s Cadillac Ranch has a full service bar, cabins, bandstand, dance floor, reception barn, and gazebo, all surrounded by the majestic Black Hills. After a long day of festivities, the newlyweds can even relax in the welcoming honeymoon suite cabin. 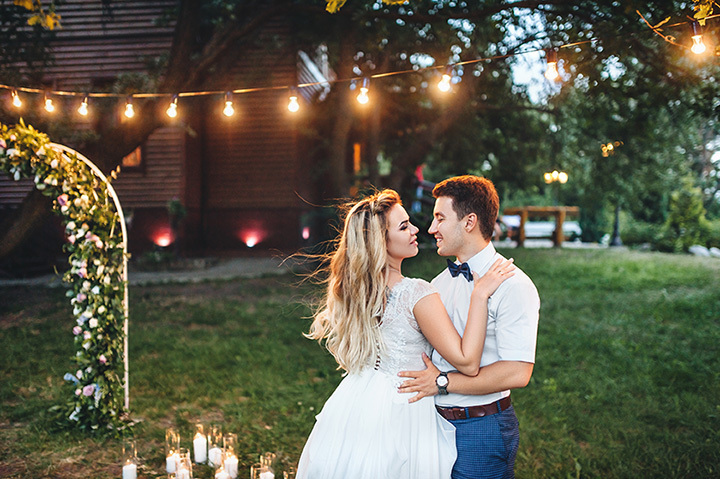 This ranch truly has everything to make your wedding a magical event for everyone! Just outside of Sioux Falls, Meadow Barn is a quiet, charming farm that hosts weddings and events in their barn on the 32-year-old apple orchard. With over 6,000 trees, Country Orchards spans as far as the eye can see, making it a unique wedding location. The rustic yet glamorous barn is huge with enough space for 400 guests. The wedding package includes tables, chairs, bar staff, and an event manager for the day of the ceremony. With such an inclusive package, the bride and groom will be able to relax and enjoy their big day! The rustic, restored Canton Barn is an ideal location for a countryside wedding. The historic barn is over 100 years-old, but still holds up well for large events with lots of guests! The loft can comfortably accommodate up to 300 people and the main level can seat about 70 people, making it a great venue for a large wedding. This venue is handicap accessible and includes a covered patio, gazebo, fire pit, restrooms on every level, and scenic spots for pictures. Summer Creek Inn is a luxurious yet charming inn on the outskirts of Rapid City. Surrounded by breathtaking Black Hills scenery, the Summer Creek Inn provides not only top-notch accommodations but also a pleasant and cozy wedding venue. The inn can accommodate groups of 50 to 150 guests and offer a wedding package that can include buffet or seated diner, menu options, beverage services, table linens and napkins, dishware service, changing room for bride and attendants, choice of ceremony site (east gardens, terrace, or waterfall), ceremony chairs, ballroom reception tent, decorating services, floral services, table decoration, and professional staff and bartenders. Granite Springs Lodge is a great venue for either outdoor or indoor weddings. The huge lodge can accommodate a large wedding party and has tons of valuable amenities. The entire resort can sleep up to 90 people. Catering, tents, dance floor, and more are available through partnerships with local affordable vendors. There’s nothing more special than getting married at South Dakota’s most breathtaking state park, Custer State Park, and it’s possible at Custer State Park Resort. Open year round, they offer a choice of ceremony locations and reception locations depending on the number of guests attending. The wedding package includes a three hour rental of the venue, garden chairs, set up and tear down, one to two outdoor tents, electrical hookup, rehearsal space, and gift and guest book tables. Offering both biker weddings and traditional weddings, Black Hills Rally Weddings provide unique weddings for unique couples. The basic wedding package includes bridal view wedding deck, site prep for cabin, decorated wedding site, seating for up to 12 guests, officiant, legal filings, and photos. During the Sturgis Motorcycle Rally, the package is heavily discounted, so plan to visit Sturgis as well! Located only two miles from the Sioux Falls Regional Airport, the Sioux Falls Convention Center is a convenient venue for accommodating out-of-town relatives. The wedding package is all inclusive with setup, tables and chairs, linens, decoration, coordinator, catering, and more, so it’s low stress for the bride and groom.